The Den-Con TS-100 Tubing Spider handles all tubing sizes from 1.315” through 4 1/2” O.D. The spider is powered by either air or hydraulic operation. 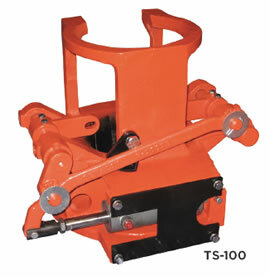 The Den-Con TS-150 Tubing Spider is rated at 150 Ton capacity, and handles pipe sizes from 1.315” to 5 1/2”. The slip assemblies are machined as matched sets and incorporate inserts which provide full 360° of contact with the pipe. The spider and slip bodies are made from high strength alloy steel castings to provide the greatest strength and longest wear life with a minimum of weight. All shafts are made from hardened alloy steel. All bearings and journals are provided with grease fittings for lubrication. The Den-Con Tubing Spiders are equipped with a manual safety latch which can provide a positive lock to keep the slips set. Manual operation is also available.